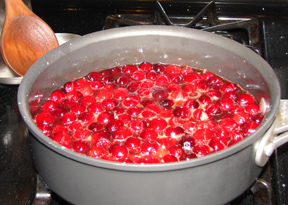 Bring cranberries and water to a boil in a covered saucepan. Cook for six to eight minutes or until skins burst. Remove from heat and stir in sugar, salt, and ginger root. Mix thoroughly. Cool and chill. 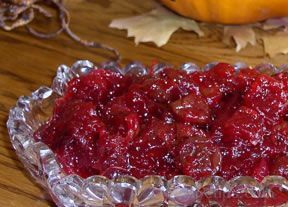 Serve with poultry, pork, ham, or veal. Makes 2 pints.